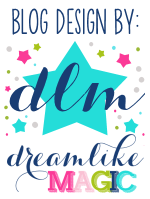 Oh my word....hope you guys didn't think I left my bloggin' career behind, but there is a little something that's been keepin' me busy these days....yes! I have another job and it's teaching and YES, I am a cutesifying-your-classroom believer. Do I think it makes a better teacher? Nope, not at all, but I think creating a space that is inviting to your students, colleagues and visitors says a lot about who you are as a teacher and your dedication as an educator. These are my focus walls that will eventually be filled with student samples, duties, information, etc...I like to add those things along with the students so they are more aware of their existence. I am excited to use Lesson Plan Diva's Math Action Cards this year, along with Differentiated Kindergarten's Ball Word Program and Fluency Cards. I decorated a lot with Kindergarten Smile's Black and White Deco Pack! I love the simplicity of them and they just happened to match my black and white theme this year (with splashes of color, of course!). We've been in school for two days and added all of our kindergarten popcorn words to the word wall already! We will be reading the room together EVERY day for a couple of weeks so that the students can get familiar with where to find the information they may need as the year goes on (shape words, color words, word wall words, etc...). As I was putting finishing touches on my room, I realized that, since I was bringing all of the same kiddos with me this year, I could use some of the anchor charts that we created last year. The problem is that I have minimal wall space to put them up around the room, soooooo....I went to the dollar store and bought a stack of black foam poster board. I will be attaching anchor charts to them so they are actually portable, can be taken out when needed or found by children who need to refer to them. YET (here's my favorite part) can neatly be stacked together at the end of the day (see small picture insert). I do think that anchor charts have a place in the classroom and I do think that students use them, but I don't like the look of a room covered in charts, no matter how pretty or functional they are. As a person with ADD myself, I tune out everything if there is information overload like that. This foam board method allows you to take out the math ones during math time, reading ones during reading, etc...You can either staple, clip (for changing out more frequently) or tape the charts onto the foam board....easy schmeasy! My new clip chart is also on foam board for portability and durability! I love the monkeys from Over the Moonbow! Ahhhh....the CRAFT Binders (a.k.a. Reading Notebooks). Very excited about this aspect (thanks for the gorgeous deco Ladybug Teacher Files!) of my reading workshop and will hopefully be able to give you a better idea of how this will look as we dive into it in our first grade classroom, as time goes on. Feeling pretty good that we got through C is for Comprehension today and R for Responding to text is all ready to go tomorrow. I really want the kiddos to take ownership over this and get excited about this independent work they are capable of! Also, click on the above picture for a great freebie that explains how my colleague (and son's teacher!) 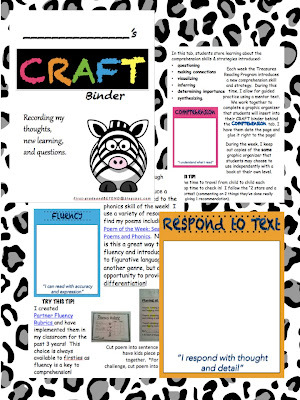 uses the CRAFT binders in her classroom. She is the one who is guiding me through this new-to-me process and I'd love to pay her back by having you visit and follow her blog. Miss Clarke of First Grade and Beyond has amazing ideas and lots to offer the blogging world! I have the kids line up outside the classroom with their MONKEY Books, I check them and then they put them in their cubby for the day. I've tried lots of systems with these, but this has worked out perfectly for us! So excited about my small group meeting area and my guided reading group chart that allows for flexible and fluid grouping! Here's the simple printable I used to make it. I just copied it onto colored paper to make it more colorful! Something I did haphazardly last year was to tape ABC charts on the student work boxes that are always on the tables. There is NEVER an excuse not to have that as a resource right at their fingertips. This year, Sounds Fun Phonics charts are going on there as well! You could also add number lines or anything other info you want your children to have immediate access to. Just in case you want your own straw, I mean pencil dispenser, head over to Amazon and grab it! I do table captains as well and both the kids and I LOVE it!!! We rotate it so not every person has a job every day, but they each get a turn to be table captain. I pick one person from each table and write their name on a white board so they know they are the table captain. Then I pick the person to their right the next day to be table captain. It follows this pattern all year and the kids get very good at knowing when they will be table captain next! I completely agree with you about anchor charts and love your idea with the foam boards, a great way to make them last and portable. Going to add that to my to do list! Where did you get your group time rug? I love the colors. Your room is so cute. I can't wait to hear about your adventures in 1st Grade! One of these days, I'm gonna loop too. I love your rug, too! And it's the exact color scheme as my room (birds, with lime and teal as the main colors). Where did you get it? I NEED it! :) Thanks for all the freebies! Awesome room! Thank you for sharing pics! I did classroom jobs for a few years where half the class had a job and then did a rotation system so everyone got a turn doing every job, but it got so tiresome!! I went to classroom helper for the day and used my class list checklist as the order to follow. The helper is announced on the chit chat chart and does ALL the jobs for the day! I LOVE it so much better! I wonder if you could still have table captains and then 1 helper a day for all other jobs! Just a thought! Happy school year! You need plenty of time and a bit of inspiration to be able to write a resume. It is a very tricky text that goes with its rules. If you don’t have any experience with that kind of text it would be difficult to write it the first time. So, after reading top resume reviews I have decided to order a resume on that resource. Guys from that service seem to be professional and talented enough. What would you do? I think that it is the best decision.